Visit FrankKuchar.com to view my newsletter archive. Copyright © 2016 Frank Kuchar, Constitutionalist, All rights reserved. 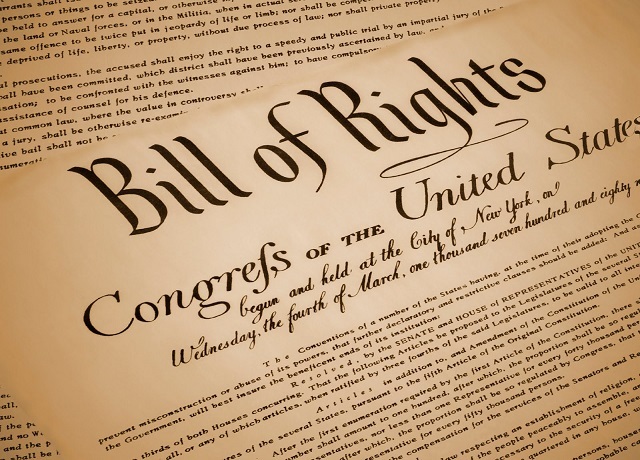 2 Responses to My Rights, Your Rights – Who’s Right? Frank, I don’t think you did much research when you speak of the “thugs” and “hooligans” in Ferguson, Missouri or Baltimore, Maryland you are obviously talking down about a whole race of people. Or maybe you did your research but continue to believe that blacks are thugs and hooligans and are not mistreated by certain police officers? Let me educate you and whoever is reading this just in case you didn’t know. I am a white female btw. In Baltimore, Maryland a black man by the name of Freddie Gray was arrested for having a small switchblade in his pocket. While in transit to the police station a perfectly healthy Freddie Gray fell into a coma due to severe injuries to his spine (this was on the report from the medical examiners office). In court the officers were charged with homicide due to a “Rough ride”. Basically they handcuffed him and proceeded to not seat belt him in and then took him for a rough ride where he was thrown about the van sustaining injuries that put him into a coma from which he later died from. Now I do not condone riots or civil unrests but I would hardly call what started out as peaceful protesters “thugs”. There were women and children there to protest the police brutality and because this had happened so many times in the last 5 years, they were fed up! Again, I don’t condone violence with violence but if you are going to tell a story then tell it right Frank. This was surely a reason to protest police brutality. Now, in Ferguson, Missouri a black man named Michael Brown was seen stealing some cigarillos from a convenience store(they are like cigarettes and cigars mixed together). It was called in to the police. Officer Darren Wilson took the call and found Brown and a friend and parked his car right in front of them. Brown was UNARMED. According to witnesses he was told to put his hands up. Some witnesses said he did but the officer still fired at him so Brown went for the gun. The officer continued to fire a total of 12 shots, more than 6 of those while Brown was running away. Do you think it’s fair to be shot to death over cigars? Maybe Brown didn’t act like he should have. Maybe he was afraid for his life? We will never know. I just don’t think officers should be shooting to KILL UNARMED people. Why not train officers to shoot knee caps so they can’t run? I’m not saying they are innocent and I’m not saying it’s ok to riot, but I understand their anger. You can bet there would have been more talking if Brown had been white. I believe there is this huge misconception that black men are scary, unfriendly, and should be treated as such. I know a lot of very well educated black men and women who are appalled at the riots but deep down cry for their people who are angry at the injustice. My husband is 6’2 and is black. Before I met him I thought there was no more racism. We have been married going on 10 years and I am telling you racism is worse now then it was 10 years ago. My husband has a bachelors degree and is working on his masters. He has two sisters and a brother that all three have their masters and one is working on her doctorate. These are the type of people protesting. They are not thugs! It’s not their fault if criminals come out and take advantage of the protest! So do please do your homework before calling a whole race “thugs” or “hooligans”. I’m sure if your loved one had been shot to death by the police without a good reason, and then it happens again and again and again, then the same thing happens to all your friends loved ones, you would begin to get angry with the police. This is what has happened. However I will point out that there are black police officers in many towns across the US that are trying to educate their partners as well as the public and I think that is a great idea. Why not have classes just like you see on “Scared Straight” Tv show but where we can bring our young black teens and let them see a black officer and have him teach them what to do when they are confronted by a police officer? For that matter, throw in all races of kids but I think it’s important that the young black kids see the adult black police officer and see that they CAN make a difference. Decades of dumb down public school education (by design) has churned out several generations of (young) adults who know little to nothing about this country’s founding & those brilliant documents, the Declaration of Independence,the Constitution & the Bill of Rights, that are literally “written directions” on how to have a limited govt. Republic, to insure all American’s rights. As long as current educational curriculum in this country continues the UN/Agenda 2030 globalist view, we will continue to see our youth move a way from our foundation of liberty and will see more “what’s in it for me? Im offended” populace growth.